Update, April 2019: With the first acceptance and award letters coming out, here’s our most recent look at understanding financial aid letters and unmet need. For college-bound students, there may be no day more exciting than the day you receive your acceptance letter. It’s a culmination of years of hard work, and an invitation to a bright future — and you deserve to celebrate! Don’t forget, however, that it’s also just the beginning. You’ve conquered the hurdle of admissions, and your college plans are taking shape. And that means it’s time to start digging in and figuring out how to understand financial aid. Along with those exciting acceptance letters comes the financial aid letter: a document that outlines the cost to attend a college or university, as well as the federal, state and school-provided funds you have available to help pay for it. The dollar amount offered in a financial aid letter makes it a powerful piece of correspondence that has the potential to make or break enrollment decisions. And it’s not always easy to understand. Have More Questions Than Answers About Your Financial Aid Letter? To help you avoid running into a similar situation, you can now access some valuable tools and advice including the Department of Education’s “5 Things to Know When Evaluating a Financial Aid Offer,” and the Offer Letter Decoder from the Hechinger Report — a tool that allows you to upload a PDF of your financial aid letter and then helps you figure out what it’s really saying. What Exactly is Unmet Need? In this example, unmet need requires some calculation. 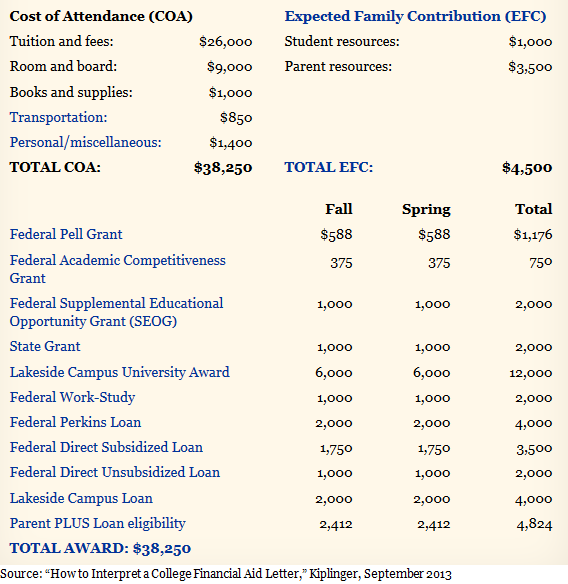 The Cost of Attendance (COA) is $38,250, and the Expected Family Contribution (EFC) is $4,500. The EFC can be combined with grants and scholarships — the best kind of awards to accept — as well as Federal Work-Study to get a total of $19,926 in financial aid. But, like the letter McKenna got telling her she had $76,000 covered, this one is intentionally vague. The bottom of the letter makes it seem like the awards total $38,250 — enough to cover full tuition. But upon closer look, you’ll see why that amount is misleading: the $19,926 in grants and scholarships doesn’t need to be repaid, but all of the loans do. That means there’s more than $13,000 in unmet need — money you’ll have to borrow and pay back. Unfortunately, this award letter doesn’t separate these options, so without careful reading and understanding, you and your family could easily find yourselves on the hook for thousands of dollars in loans. Reading your financial aid letter and figuring out unmet need puts you in a much better position when it comes time to fill out your FAFSA and search for scholarships. Reducing confusion surrounding your family’s unmet need. Once you’ve gotten the hang of decoding offers, you can compare financial aid letters from each school of interest to determine what each one will really cost. Understanding financial aid — and knowing what you and your parents can contribute — will help the entire family. Creating a plan of attack. Most schools don’t have the funds to cover the financial needs of every student enrolled. Rather than being surprised by the unmet need, you’ll be ready to discuss different ways that you can pay for the rest of tuition — including the benefit of “free money,” like grants and scholarships. You’ll notice on the sample letter above that private scholarships — like those available on our Student Hub — aren’t listed, and those can go a long way toward reducing unmet need. In addition, if your dream school just doesn’t seem to be working out financially, you may want to appeal your offer. CollegeUp.org has a helpful blog post on how to write a financial appeal letter. Preventing missteps down the road. Researching and discussing financial aid lessens the stress of unmet need once it’s actually time to cut checks. It’ll also lay the groundwork for future planning. After all, unmet need doesn’t end after one conversation; a financial aid package covers just one academic year. There’s no guarantee that the amount of unmet need will be the same year after year, but it pays to know about it at the start of your college career. Paying for college is one of the biggest investments you’ll make, so you can’t afford to be uninformed. But with preparation, understanding and planning, the excitement of college acceptance day won’t have to wear off because of money.